Of all the organizational systems I’ve ever tried, the Bullet Journal is by far my favorite. The analog organizational system ironically designed by digital product designer Ryder Carroll is the perfect blend of simplicity and effectiveness. Although hundreds of variations of Bullet Journals have popped up, each with their own additions and changes, the core of the Bullet Journal system is incredibly simple, consisting of just four main components. The first three components comprise the different main entries in the Bullet Journal: the Future Log, Monthly Log, and Daily Log. The fourth component is called “Rapid Logging” which is the simple, intuitive, yet powerful way of recording your thoughts and tasks. I’ll describe them briefly for those of you who are unfamiliar and then I will talk about what I think some of the advantages of this system are. Think of the Future Log as an “at a glance” calendar. It exists, as the name suggests, to let you look into the future and plan for events that are a long way off. 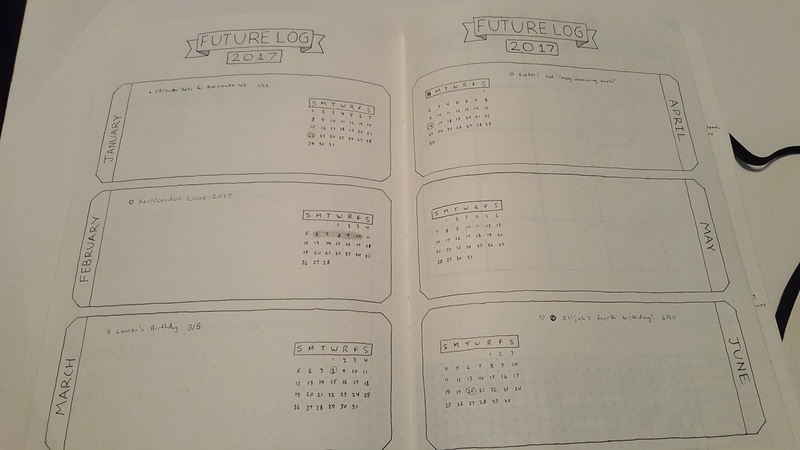 Typically, you can fit three months pretty comfortably onto on page of your Future Log, so a 6 month Future Log would take up one full spread in your journal (this is how my wife set hers up. I opted to create a Future Log for a full year right off the bat so mine takes up the first two spreads in my journal). 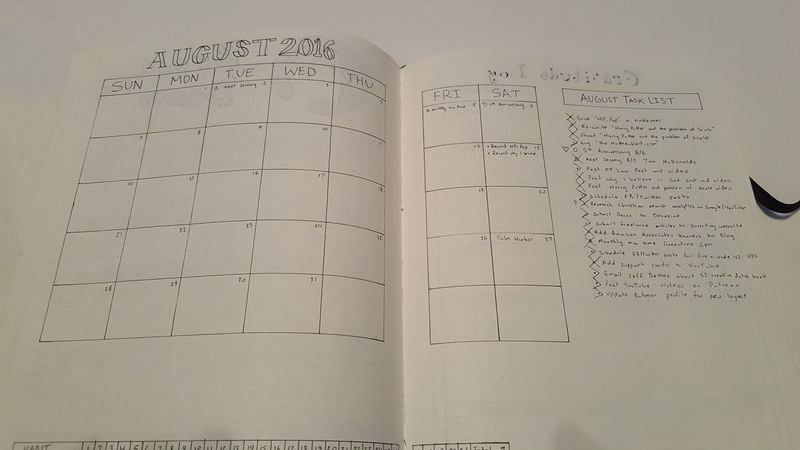 The Monthly Log serves as both a Monthly Calendar as well as a Monthly to-do list. The calendar lets you visualize your month and having a monthly list of tasks and appointments helps you see where there is time to get everything done. Each time you create a Monthly Log, you should consult your Future Log to see if there are any items recorded there that need to be added for that month. Not much to say here. This is your daily to-do list of tasks and appointments. It, like the monthly task list, runs off of Rapid Logging. The bullet point indicates a task that needs completion, so in this example you still need to pick up the dry cleaning (which is of course a must-have item on every fake to-do list). A note is indicated by a dash, in this case you made a note to yourself to remember that you have a coupon in your wallet (good job being frugal). The star/asterisk next to it is one of the most commonly used signifiers and it simply signifies importance. Usually you cross out a task once complete, so here the “X” indicated that you mowed the lawn. A circle indicates an event or appointment. The last two signs are important as they signal what is called “migration.” Migration simply means that you aren’t going to complete the task today so you moved it somewhere else. The > means you are pushing it to the next day (or to the next month if it appears on the monthly log). The < sign is pointing back to earlier spreads (the Monthly and Future Logs), meaning you aren’t going to do it tomorrow but have instead scheduled it for sometime in the future (shame on you. Get that blog post done). To some extent we are all familiar with bulleted lists and have probably even naturally used signifiers. The Rapid Logging system deftly makes use of multiple types of bullets in the same list to keep things organized while making the information easy to process. It also makes good logical sense to start with a bird’s eye view of your year (the Future Log), and then slowly zoom in with the Monthly Log until you get to the granular level of the daily log. One of the drawbacks of having one great, big, to-do list is that you can put off important item indefinitely while occasionally picking off unimportant tasks. By it’s very nature, every task that you record in your bullet journal has a time limit (one day for the daily log, one month for the monthly log). This ensures that you are constantly forced to evaluate how you spent your day and what you accomplished. Each day you create a new task list, and so if there are items that just keep getting passed on from day to day or if the only items that make it from your monthly list to your daily list are unimportant, you will notice very quickly and be able to do something about it. One of the interesting things about the bullet journal is that you are constantly forced to evaluate the connection between time and the execution of various tasks. You begin to notice if you are able to handle everything on your list for a given day or month and you start to get a good feel for what can be accomplished in a given period of time and how long different tasks take. This helps you naturally grow in your time-management skills as you become more adept at assigning various tasks to different units of time. Do a search on YouTube or Pinterest or Instagram for “Bullet Journal” and you’ll soon discover that almost every one is different. Not only is there a tremendous variety of ways to implement the core concepts of the Bullet Journal, the Bullet Journal system itself fits in with almost any other type of journaling that you are doing. Look at some people’s Bullet Journals and they will look more like scrapbooks than organizational systems. If you haven’t tried Bullet Journaling, I highly recommend it. I’m the kind of guy who has struggled my whole life to get organized and the Bullet Journal has worked better than anything else. I recommend checking out this video that I recorded after my first month of Bullet Journaling where I walk through my Bullet Journal and show some of the other features that I’ve added. Matthew, this was wonderful! Your excitement about bullet journaling really provided me with the push that I need to begin with this! I look forward to viewing your wife’s journal too. Thanks again. The flexibility of the Bullet Journal is my favorite aspect of it. I love that if I mess up, don’t like the set up, or just don’t have anything going on, I’m not wasting space and I just need to turn to a fresh page.